Ahmed Saeed, a Libyan poultry farmer, says he is waiting for his country to open Islamic banks to deposit money for the first time. Once a law that allows the establishment of stand-alone Islamic banks gets approved later this month, Libya’s interim government may be able to attract cash from people like Saeed, deputy central bank governor Ali Mohammed Salem said. Islamic lenders in Libya, where some banks offer Shariah-compliant services, may attract some of the estimated 15bn dinars ($12bn) outside the banking industry, he said. Total commercial banking assets were about 71bn dinars at the end of 2011. The nation, where almost all the 6.7mn people are Muslim, saw its economy shrink 61% last year after an uprising that toppled its ruler of 42 years Muammar Gaddafi. Oil production dropped to virtually zero from 1.6mn bpd. The holder of Africa’s biggest crude reserves is now pumping more than 1.3mn bpd, data compiled by Bloomberg show. Its economy is expected to surge 76% this year, the most since at least 1988, the International Monetary Fund estimates. While Libya doesn’t need financial assistance from the IMF, it needs guidance to lower unemployment and to improve the business environment, including increasing access to finance, the fund said on April 16. “Islamic banks could be one of the tools of development,” the central bank’s Salem said. “We hope that Islamic banks will focus on real investments and not just consumer-linked products such as cars.” Transactions in Islamic finance are based on the exchange of assets rather than interest to comply with Shariah principles, as well as profit and loss-sharing agreements. Mustafa Abdel Jalil, the chairman of the National Transitional Council in Libya, said in October the interim government plans to eradicate interest from the banking industry. Charging interest “brings about disease and creates hatred,” he said. Interest-bearing accounts, such as savings and time deposits, fell 8% and 6.6% respectively last year compared with 2010, according to a report published on the central bank website. So-called demand deposits, which don’t pay interest, rose 9.5% last year. Gumhouria-Bank, a state-owned lender, has three branches offering Islamic banking services and is unable to cope with requests from companies and civil servants, according to Jamal Ajaj, the director of the lender’s Islamic banking project. Demand for Shariah-compliant financial services helped establish “informal banks,” he said in an interview in Tripoli April 19. “It’s proof that Islamic banks will support the economy and bring out the money stored in the homes and the excess liquidity at corporates,” Ajaj said. The central bank said in October that it plans to allow lenders to sell Islamic bonds to help develop banking services. Egypt and Tunisia, which saw uprisings that led to the ouster of long-serving rulers, also plan to permit the sale of debt that comply with Islamic principles. Bahrain, Dubai and Ras Al Khaimah are the only sovereigns in the Arab world to sell global dollar-denominated sukuk. The average yield on Islamic debt in the six-nation Gulf Cooperation Council, which includes Arab sovereign sukuk, fell 45 basis points so far this year to 3.86% on Friday, HSBC/Nasdaq Dubai GCC US Dollar Sukuk Index. Global sales of sukuk more than doubled so far this year to $12bn from the year-earlier period, according to data compiled by Bloomberg. While Libya’s central bank is keen to boost the nation’s economy with Islamic banking, the new government has struggled to rein in armed militias built around regional and tribal loyalties. 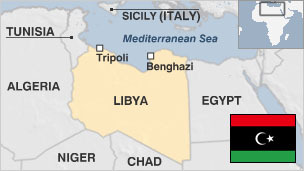 The groups were instrumental in toppling Gaddafi and have largely refused to disarm before the central government provides more funding and services to their respective regions. The central bank’s priority in the first three years is to develop domestic Islamic lenders before opening the door to international banks, Salem said. Libya will honour bank licenses issued before last year’s civil war, including one given to Qatar Islamic Bank, Central Bank governor Saddek Omar Elkaber said in November. Demand for Islamic financial services is likely to appeal to a wide segment of the population, many of whom withdrew their money during the revolution because of concern that their cash was safer at home than in banks, said Essam al-Zleiteeni, an employee at the Ministry of Culture. He is waiting for an Islamic bank to open before he will return his savings.